BOSTON – Today, Governor Charlie Baker and Lt. Governor Karyn Polito were joined by House Speaker Robert DeLeo, Senator Jason Lewis, Representative Ruth Balser, members of the Legislature and a coalition of groups led by the Massachusetts Commission on the Status of Women to participate in the ceremonial signing of An Act Providing for Equitable Coverage in Disability Policies. The legislation prohibits insurers that offer disability insurance from charging higher premiums or otherwise setting terms and conditions of coverage based solely on gender, race, religion, national origin, or other personal characteristics. 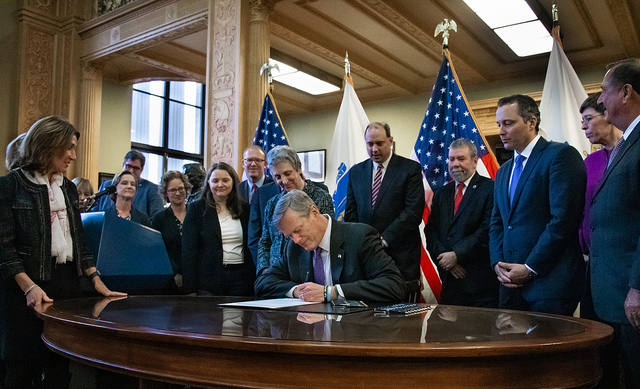 “We are pleased to join Governor Baker, Rep. Balser and Sen. Lewis in celebration of this victory for women’s economic security, and to affirm the Commonwealth’s commitment to equality under the law,” said Nina Kimball, Chair of the Massachusetts Commission on the Status of Women.